Underneath Their Robes: Judicial SIGHT-ations: Federal Judges Busting Out All Over! Judicial SIGHT-ations: Federal Judges Busting Out All Over! I was at the annual Red Mass (held for those in the law profession) [a few] Sundays ago at St. Matthew’s Cathedral in D.C. and spotted all three Roman Catholic justices of the Supreme Court. Unfortunately, all three justices sped off before anyone could attempt to say hello. One thing I noted was the order in which they left – Scalia, Kennedy, and then Thomas. Do they obey seniority even in public situations, or was it pure coincidence? I was at the mass the previous year and the Chief Justice happened to be there as well (although he is not Catholic) as well as Scalia. Rehnquist left first last year, so I have to wonder if this is not a coincidence. Incidentally, Rehnquist walked off chatting away with Cardinal McCarrick – a scene I am sure that would have sent chills down Barry Lynn’s spine (Americans United for Separation of Church and State). Article III Groupie says: Thank heaven for little girls--and Supreme Court justices! No saint herself, A3G is grateful for her religious reader's report. She also has a question for her Catholic readers: there are several patron saints for lawyers; is there a patron saint for gossip columnists? 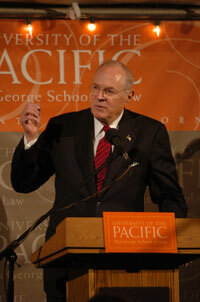 Justice Kennedy [pictured at right] returned to his hometown of Sacramento this past Saturday to attend the 80th anniversary of McGeorge School of Law, where he has taught for almost 40 years. He was a fabulous Con Law professor. A3G hopes that AMK enjoyed his time soaking up the California sun, and she wonders: Did he return to Washington with tan lines underneath his robe? My law and economics seminar had the pleasure to hear [Seventh Circuit] Judge Richard Posner present his paper on tools of contract interpretation today. I'm not sure that the discussion between the famous judge, some of the attending professors, and the eminent Judge Michael Boudin of the First Circuit changed my opinion of Posner's paper, but the appellate judiciary's most prolific writer did manage to get off one particularly stinging line - pointing absently to an outline of his piece on the projector, Posner noted (I paraphrase), "my paper meanders a bit, but I will say that it's not plagiarized." I'm pretty sure everyone here got his point. My goodness! A3G is surprised that Pound Hall didn't burst into flames from this agglomeration of federal judicial superstars! The combined brainpower of Judge Posner and Judge Boudin could have ripped Gannett House out of the ground and tossed it across Mass. Ave.; the sheer feeding power in that classroom could have solved many an African famine. Today Judge Posner is most closely associated with the University of Chicago Law School, where he was on the faculty for many years (and where he still teaches, and occasionally forgets to return library books that his research assistants have borrowed on his behalf). Judge Boudin's allegiance to Harvard Law School remains undivided; his ties to HLS have stayed strong over the decades. Judge Boudin taught at the Law School part-time for many years, while still practicing law (and later serving as a district judge) in Washington, and he is married to HLS Professor Martha A. Field. Judge Boudin and Professor Field live in Cambridge, within walking distance of the Law School (although it's a long-ish walk). Hello from "the 'hood," i.e., Newark, NJ. I just came back from picking up lunch, after dodging bullets (okay, panhandlers) on Broad Street. While I was out and about, I spotted a judicial celebrity of the first order: Judge Michael Chertoff of the Third Circuit, former AAG for the DOJ Criminal Division (and a member of the Elect, having clerked for Brennan). Judge Chertoff [pictured at left] has been colorfully described by one leftist commentator as "Ashcroft's Top Gremlin" and "a scary looking guy if ever there was one" [click here], but I didn't find him scary-looking; intense-looking, sure, but not "scary." He's lanky and lean, with a thin, elegant silver beard. He was walking with another tall but much younger fellow, presumably one of his law clerks. Today Judge Chertoff's overall look was "ghetto-fabulous." The "fabulous" part was this beautiful, very expensive-looking car coat, in a rich, chocolate brown wool. (If I had to guess, I'd say Zegna.) And the "ghetto" part? His Honor was carrying his own take-out lunch, in a white plastic bag with an enormous yellow smiley face on it. Quelle horror! A3G agrees that this is pretty horrifying. She must also chide Judge Chertoff's law clerk for not going out to pick up the boss's lunch for him (or, if Judge Chertoff insisted on coming along for the walk, not carrying the judicial lunch on the way back to chambers). What good is a law clerk who can't fetch the Article III wittles? Last week I went to a debate on gay marriage sponsored by the New York chapter of the vast right-wing conspiracy. The debate was nominally about who should decide the issue (e.g., courts vs. legislatures), but it included significant discussion of the underlying merits. It was a pretty lopsided affair: Professor William N. Eskridge of Yale Law School trounced Professor Hadley Arkes of Amherst College. The most entertaining part of the evening, in a Jerry Springer-ish sort of way, was Professor Arkes's shockingly rude treatment of the moderator, Judge Loretta Preska (S.D.N.Y.). When Judge Preska gently tried to get the meandering Professor Arkes back on topic, he bristled. With barely suppressed anger, he said, teeth clenched, "I would appreciate the courtesy of being allowed to finish my remarks." He later referred to Judge Preska, in a very snide tone, as "the so-called moderator" and "the immoderate moderator." 1. Judge Loretta A. Preska (S.D.N.Y.). In a word: magnificent. Tall, thin, elegant. Great bone structure, perfectly coiffed silver hair. Note to self: nominate for superhotties contest next year? Fabulous dark blue suit. Who designed? Dramatic, extra-long jacket, white-trimmed lapels; tapers down towards clasp, then flares out again--gorgeous cut. Nice accessories: big gold eagle pin, ladies-who-lunch pearl necklace, matching earrings. Delivers intro like newscaster, smooth as butter. Gestures grandly with long fingers; flawless manicure. WOW! Judicial style score: 9.5. 3. Judge John E. Sprizzo (S.D.N.Y.). Somebody call FEMA--federal judicial style DISASTER! Morbidly obese. Hideous, thick-framed black eyeglasses--plastic? Balding, with remaining hair "sprizz"-ing out in all directions. Judicial pay not partner money, but NO EXCUSE for ugly grey jacket from Salvation Army. All in all, hopeless case, beyond makeover--could not be saved even by Fab FIFTY. Worse than Ruthie! Judicial style score: 2.5. I later learned that two other federal judges--Judge Richard Owen (S.D.N.Y.) and Judge Samuel Conti (N.D. Cal.) --attended the event. Unfortunately, I didn't get to scrutinize them that night. Also on the scene: right-wing uber-blogger James Taranto of Best of the Web Today, who can be very funny sometimes (even though his conservative politics--like yours, A3G--are pretty f***ed up). Taranto was actually looking kinda cute--although more time out in the sun, or maybe on a treadmill, wouldn't hurt him. A3G thanks "S.D.N.Y." and all of her other correspondents around the country for these wonderful Article III celebrity sightings. Please keep them coming! And now Mike Chertoff is set to become an even bigger (although non-judicial) celebrity: Secretary of the Department of Homeland Security.